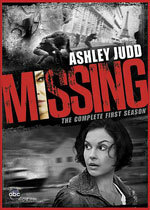 Missing: Mystery and Suspense on Television. When Becca Winstone (Ashley Judd) learns that her son, Michael (Nick Eversman), has disappeared while studying abroad, it's a race against time when she travels to Europe to track him down. At 8 years old, Michael watched as his father, CIA Agent Paul Winstone, was murdered. Now 10 years later, Paul's wife, Becca, is faced with the reality of her son growing up. When Michael is afforded the opportunity to study abroad, his mother reluctantly agrees it's time to let him go. Just a few weeks into his trip Michael disappears, and Becca immediately suspects foul play. When she arrives in Rome, she begins piecing together the clues left behind. It isn't long before the kidnappers realize they've picked a fight with the wrong woman. Becca Winstone has a secret of her own — before Paul's death, she was also a lethal CIA Agent. But if she wants to find her son alive, Becca will have to rely on old friends and reopen old wounds. Her resourcefulness, skill and determination will be put to the test – but a mother's love knows no limits. This ABC drama premiered during the 2011/2012 mid-season but was not renewed for a second season.